"Custer Died for Your Sins: An Indian Manifesto" is the examination of the historic treatment of American Indians by settlers and by the government and looks at how the policies governing that treatment are still at work in modern times. Many words have been used over the years to describe Vine Victor Deloria Jr.—author, scholar, lawyer, activist, educator, historian, political scientist and theologian. He has been called a visionary and a warrior, a radical and a mentor, a philosopher and a hero. Time Magazine referred to him as one of the 11 greatest religious thinkers of the 20th century. Many of today's Indigenous leaders cite Deloria's written word as helping to inspire them to be involved and make a difference. He has been called a modern-day Crazy Horse, an Indigenous Martin Luther King and the most influential Native-American leader of the last half of the 20th century. He has been praised for his use of wit, wisdom, compassion and humor to deconstruct the non-Native world's stereotypical view of the American Indian, and for his long, hard fight for the rights of Indigenous people across the continent and around the world. 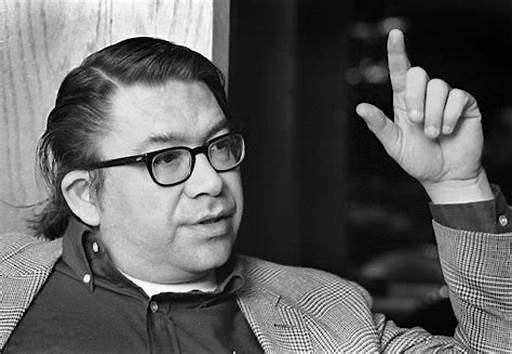 Deloria was born on March 26, 1933 in Martin, South Dakota near the Pine Ridge Oglala Sioux Indian reservation, a member of the Standing Rock Sioux tribe. His father was an Episcopalian minister, as had been his father's father. Deloria's great-grandfather, Saswe, had been a medicine man who had been guided by a vision that foretold that four generations of his family would be spiritual leaders. His family had scholarly roots as well. Deloria's Aunt Ella earned a degree in education from Columbia University in New York and worked to preserve and promote the Sioux language. She created a Lakota grammar text and dictionary and books documenting Sioux legends and stories and the Dakota way of life. She used her fluency in Lakota, Nakota and Dakota to translate ethnographic texts and teach the languages to anthropology students. In the 1950s, Deloria spent some time in the United States Marine Corps, then attended Iowa State University where he earned a degree in general science. In 1963 he received his masters degree in theology from the Lutheran School of Theology in Rock Island, Illinois. But, despite earning the degree, Deloria didn't follow in the footsteps of his father and grandfather. Instead, he found himself at the National Congress of American Indians (NCAI). His work as the organization's executive director thrust him into the heart of the civil rights movement and into the spotlight as spokesperson for the NCAI. Under his leadership, the organization was pulled from the brink of implosion due to financial and management problems and internal division and was able to focus on uniting the nation's Indigenous people in their fight for better treatment at the hands of the federal government. In 1969 he took his message to a wider audience with publication of his first book, Custer Died for Your Sins: An Indian Manifesto, in which he examined the historic treatment of American Indians by settlers and by the government and looked at how the policies governing that treatment are still at work in modern times. That book was named as one of the 100 best books of the 20th century by the quarterly book review magazine Hungry Mind Review and has been published in 30 languages. More than 20 other books followed. In 1970, Deloria earned a law degree at the University of Colorado at Boulder and, in 1971, he founded the Institute for the Development of Indian Law. Deloria taught American Indian studies, political science and history of law at the University of Arizona from 1978 to 1990. From 1990 until 2000, he taught at the University of Colorado at Boulder, affiliated with the departments of history, ethnic studies, religious studies, political science and the university's law school. He was involved in the creation of the Smithsonian Institution's National Museum of the American Institute. A founding trustee of the museum, he helped facilitate the sale of the Gustav Heye collection to the Smithsonian, and dedicated himself to the protection and repatriation of Indian remains. Deloria was not one to shy away from controversy and was never afraid to share his views and opinions freely, always standing up for what he believed. Over the years he took aim at any number of targets, from Christianity and the role it played in eroding Native American culture and way of life, to the theory that North America's original peoples travelled to the continent via a land bridge that once existed across the Bering Strait. He shared his views on history, law, religion, politics, education and culture. He urged Indian people to wage a war against the status quo, to fight for rights, for self-determination, for a better life. But, he said, that war must be fought in the intellectual arena if it is ever to succeed. In 1992, Deloria took part in efforts to have the trademark of the Washington Redskins football team revoked because the name and image are offensive to Native people. Deloria was again standing up for something he believed in when, in 2004, he turned down an honorary degree the University of Colorado was to bestow upon him in protest of the school's handling of a scandal involving its football team. A female place kicker on the team had come forward claiming she had been sexually assaulted by teammates. The coach responded to the charge by criticizing the woman's abilities as a place kicker. "It's no honor to be connected to these people," he said in refusing to accept the degree. In 1996, Deloria received the Native American Writers Circle Lifetime Achievement Award and in 1999 was named Wordcraft Circle Writer of the Year. In 2002, he was recipient of the Wallace Stegner Award, given by the Center of the American West to individuals who contribute to the cultural identity of the West. In 2003, he received the American Indian Festival of Words Author Award, presented to him by the Tulsa Library Trust in recognition of his significant contributions to contemporary literature. Deloria received the American Indian Visionary Award, presented by Indian Country Today to honor leaders who defend the foundations of American Indian freedom. Deloria retired from teaching in 2000, but by no means did that mean retirement from his life's work. He continued to give presentations and lectures. And, with more than 20 books dealing with Native American issues to his credit, he had begun work on his next writing project, a book chronicling historical accounts of the spiritual powers of Indian medicine men. He'd hoped to have the book completed early in 2006. Deloria was living in Golden, Colorado with his wife Barbara when he was hospitalized after suffering an aortic aneurysm. It was complications from the aneurysm that resulted in his death on Nov. 13, 2005 at the age of 72. When word began to spread of his passing, many people who had known Deloria or whose lives had been changed by his work and his words took time to remember and mourn a great man, celebrating his many achievements and regretting that the road ahead he'd set for himself would remain untraveled.